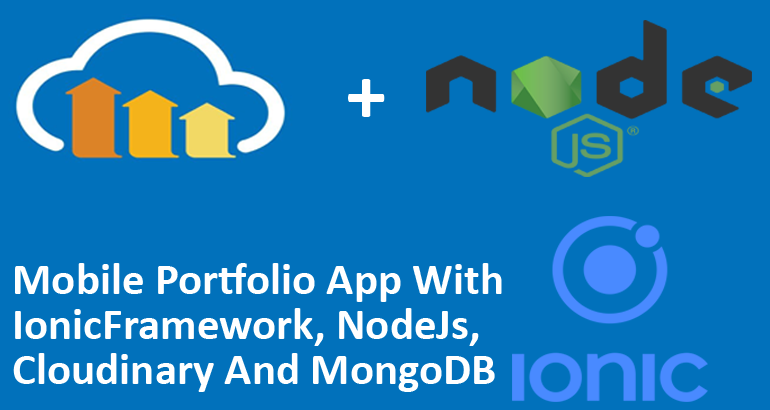 This article shows you how to build an portfolio mobile app using Nodejs, Cloudinary, MongoDB and Ionicframework. I assumed that readers of the this series already have basic knowledge in NodeJS,MongoDB and Ionicframework. The API will be written with NodeJS. Let's begin with the API. Create a folder named mobile-portfolio-nodejs-api and cd into the directory from your favourite command line tool. Run npm init and follow the instructions to generate package.js file. All the dependencies needed for the project has been included in the package.json file. The next thing is to run npm install to bring in all the dependencies from the package repositories online. The code is pretty simple, we created our server using express and we asked the server to listen on port 5000. As it is the app isn't doing anything cool currently. Let's create the database where all the portfolio app data will be stored. We are going to be using MLab. This is a Database-as-a-Service for MongoDB, I wont be covering how database can be created in MLab there are lots of articles online that can be of help. Create the database and name it mobile-portfolio. The next thing is to find a way of connection to the database from within our express app. Create a folder called configuration in the root of the project folder and add a file named app.config.js, add the code below to the file created. Replace the dbUrl with your own url as copied from MLab dashboard. I wont also be covering how to register and setup a free cloudinary account in the article. That can be found on their blog. After setting up a free account, there three essential information that are needed to enable our app communicate with cloudinary which are api_key, cloud_name and api_secret. Currently, if we run the app using node index.js and we try to check our browser via http://localhost:8000 you will see that the app isn't coming up. That is because no route has been defined. If we run node index now our app should be running on port 8000. That is it! Our API is ready. In the next article I will walk you through on building the mobile app. Till then happy coding.